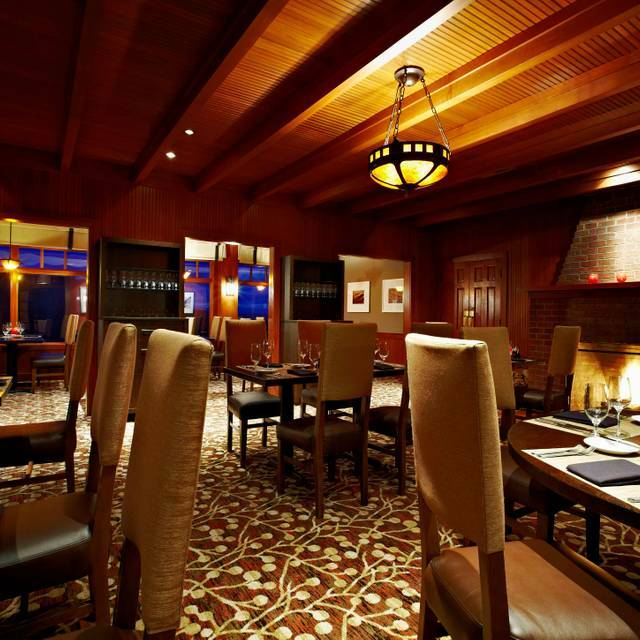 You must make reservations at least 5 minutes in advance of the time at The Dining Room at Salish Lodge & Spa. Our team is available for a consultation. We look forward to speaking with you. Excellent service and excellent food, plus a wonderful view. Ambience and view of Falls spectacular-food way overpriced for what you got. My Halibut was perfect and delicious but way overpriced even though it was Halibut which runs at least $20 a pound. Accompanied by a handful of thumbnail sized potatoes in a great sauce, but not a $49 plate value. My husbands scallops could have used another few minutes on the grill, they weren't done to his level, again not a $44 value because only accompanied by a small amount of vegetables and Cous Cous. Anthony's Home Port serves the samae with bigger portions for half the price. service was fantaastic. 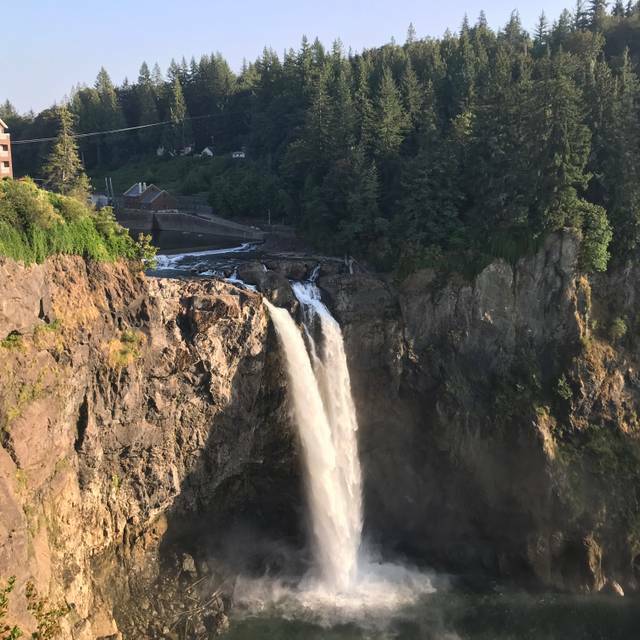 You're paying for the name Snoqualmie Lodge. Off our bucket list but worth doing once if you can afford it. I took my husband there for his birthday dinner, and had a great time! The scallops, and they were AMAZING! This was beyond amazing. Our server and dinning experience was beyond what we expected. We had our own little private area and was hosted with rose petals on the table and even received a complimentary celebratory drink and an anniversary dessert which was all so wonderful. We were so appreciative of these extra special touches. This was the highlight of our wedding anniversary!! Thank you so very much to both Amanda our pleasant server who was very helpful in offering suggestions regarding my dietary restrictions, the hosts who sat us at this wonderful table and the chefs for making amazing food. Food was good, but prices were very high. Further, a mysterious 3% "service charge" was added. The management seems curiously obsessive about reservations, even when the dining room was 2/3 empty. Excellent food- I had the elk and we started with a tasty polenta and cheese curds side . Good wine, very friendly and professional service. Expensive but it’s a high end resort so that’s expected. One of my favorite places locally. Bring all of my visitors there for breakfast. Thank you for everything! Fantastic staff. Rooms were excellent. Food delightful. Server was excellent. Food was delicious. Will be back soon. Priced a little high but great view, service, and food! Great food! Honey from Heaven biscuits...delicious. The Honey Ricotta Brioche French Toast was amazing! However the Crab Benedict is beyond unbelievably good! Sunday brunch at 8:45am. 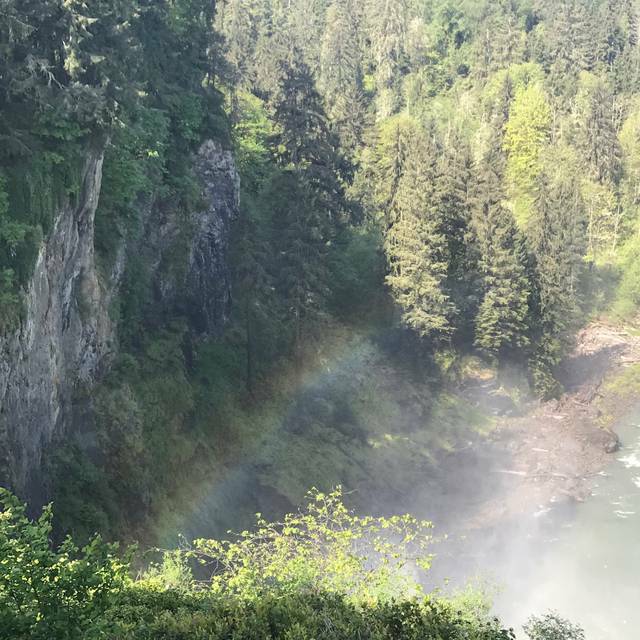 Seated at the window overlooking the falls with a constant rainbow. Selected the classic 4 course brunch. Everything I had heard about was true. Great service, food was plentiful and very good. Oatmeal was my least favorite course...flavor was somewhat different than typical rolled oats that I have had. Great selection of pastries and the final course was more than I could finish. Only 2 observations...although I know that I am paying extra for the location, it did seem a little pricey for what you receive. Also I think the wait staff should notice when the current course is almost finished before bringing out the next one or at least ask customers if they are ready for the next course. I felt like we had we had to keep plowing through the courses or they would pile up on the table. That said, we didn't feel rushed overall and I would do it again for sure. Dry-aged ribeye was delicious! Great desserts. Liked the bacon Brussels sprouts side as well. Good food, good service, was expecting a view but I'm not sure they offer that. I would recommend and will go again. The food was excellent. The atmosphere was outstanding. 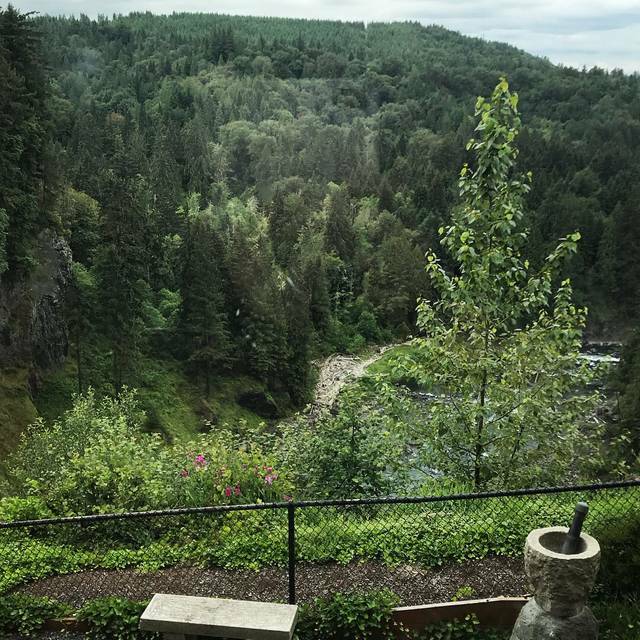 We will be definitely take our family and friends to Salish Lodge and Spa. Yes--the view was fabulous and the dinner and breakfast were both beyond what we had expected. The service (Michael for dinner) and can't remember the breakfast woman were just right! Have enjoyed the Falls and amenities since I was about 5 yrs old, my wife and I just celebrated our 50th. wedding anniversary there, so we have watched the growth and transition for a long time. Always a delightful experience, filled with memories and quite refreshing. This place was amazing. We stayed at the lodge on a long weekend getaway and this was our night out dinner. The food, waitstaff, atmosphere, everything was incredible. I would highly recommend this place to anyone heading towards Salish lodge. We shared the ahi appetizer. I got the St. Helens filet mignon which melted in my mouth and my husband got the at Helens rib eye. He loved his as well. I can’t remember the name of the desert but it was Snoqualmie something and had honey miirangue and blackberry compote. Very delicious. We have been to The Dining Room several times, and it is always a treat. 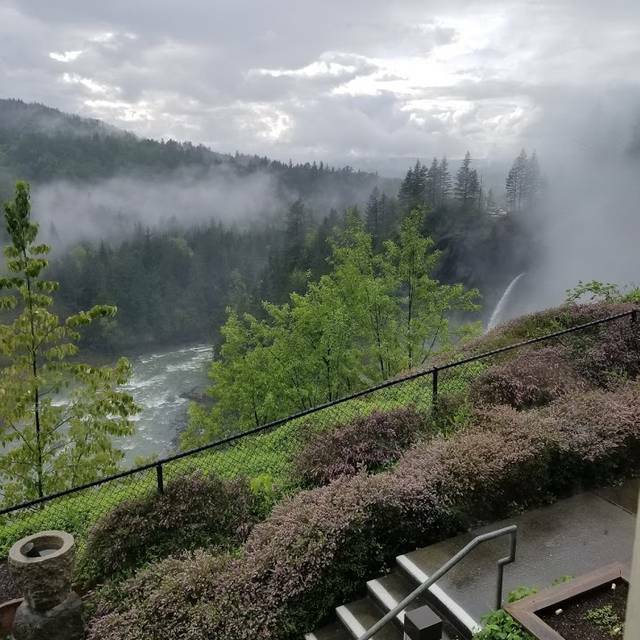 Whether you're seated next to the cozy fireplace or next to the window overlooking the river coming from the falls, it's a lovely place with tasty food and excellent service! Food service excellent, noise level very accommodating to dinner conversation, not too loud at all. The service was wonderful. The food continues to be overpriced and average. I could eat the same meal anywhere else for less than half the cost. Overall we go for the experience of getting out of the city. Absolutely incredible food! As amazing as this lodge is, the dinner was probably my favorite part. We will definitely be returning for weekend stays to relax in the future! Our party celebrated a special birthday tonight. I had read some earlier reviews that had mentioned it was a relaxed atmosphere, so I was prepared for the meal to take a while, and I knew that the prices were a bit higher than a run-of-the-mill restaurant. We ordered several different dishes, and each was excellent. Really. The bacon grilled Brussels sprouts and the venison were good choices for starters, and were shared around the table. The baby greens salads were also well received. Two in our party had the pork chop, and we were both well satisfied. They were grilled perfectly, and tasted terrific. We were also pleasantly surprised at the portion size for the smoked duck, but that was nothing compared to the flavor. Fabulous. The scallops and the ratatouille both also scored high marks. Unfortunately, we were too full to try the desserts, but we did share the small piece of cake they brought out for the birthday. Even that was excellent. We're happy we remembered this gem in our backyard, and we look forward to returning in the future. Had a late lunch with the family. The food and drinks were pretty good. Was abit disappointed with my crab omlet. It was more like a rolled egg roll with very little crab filling, not worth the price. 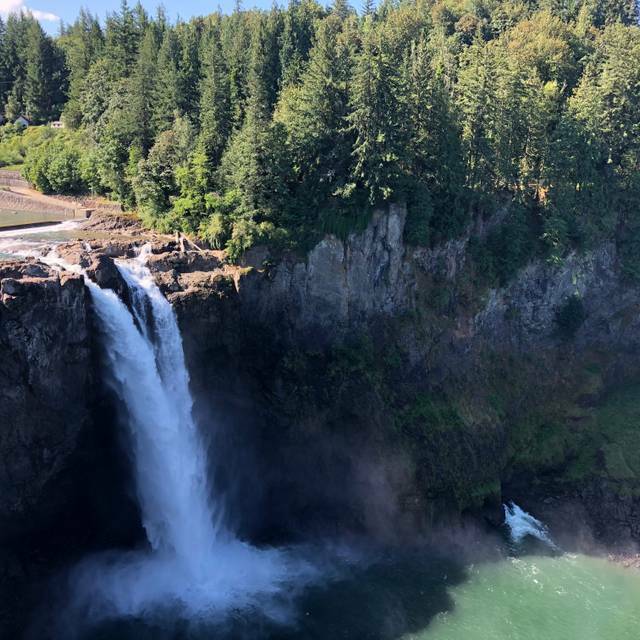 Also disappointed that we did not have a view of the falls. Had a view of steps. I think the server was new but he was very pleasant and attentive. Lovely place to have an amazing breakfast. We spent the most money ever for breakfast and would do it again. Had the Country Breakfast, it was delicious and relaxing. Worth every penny. Will be back, for our next special occasion. Beautiful views, tasty food, and great service! Great for a special occasion brunch or dinner. 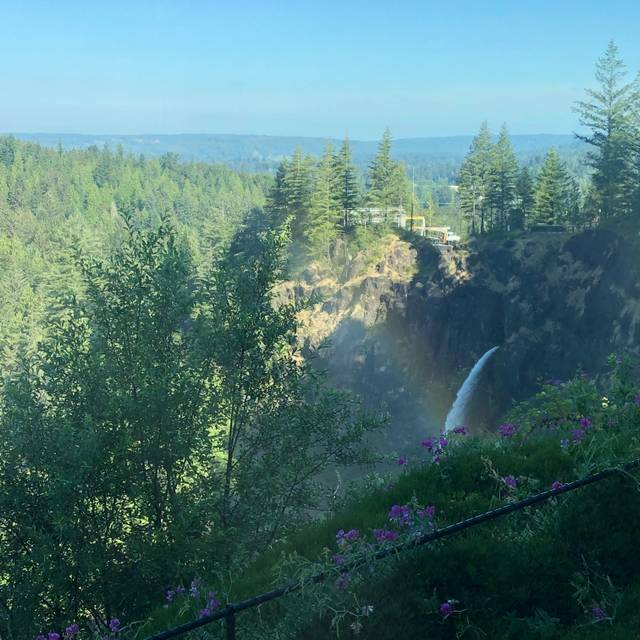 We have been to The Dining Room at Salish Lodge & Spa twice now and have not been disappointed either time. The food is amazing. Presentation is impeccable! I made reservations this year to celebrate our 10 year anniversary and the table was set up with rose petals, and we were presented with a glass of champagne each to thank us for staying at the lodge. They also brought us a piece of cake saying, "Happy Anniversary!" We also had breadfast there the next morning and were not disappointed. We plan to go back the next time we are in Seattle. Brunch was wonderful! Great view, great service and great food! The entire visit was wonderful. Amazing food,service,drinks, view and ambience. We love this place and keep coming back. It's always an amazing time at The Dining Room. I love the attention to detail and thoughtfulness of the staff and kitchen. Such a wonderful way to celebrate a birthday. Had a great meal and service was first rate! The meal itself was very good but fell short of spectacular which is the reason for the 4 stars instead of 5. I had the filet mingon and it was well prepared and tasted good. The sides were two spears of asparagus (good) and a few small potatoes that were a little undercooked and still slightly hard inside. Wasn't a big enough deal to complain but I'm sure they would have taken care of it if I had. My husband had the Chinook salmon which was perfectly prepared and served on a bed of lentils which was an interesting choice. Those also seems slightly undercooked but I don't eat lentils often so perhaps that is normal for them to be firm. He also ordered a side of mashed potatoes which we both shared and it was delicious! My husband had two of the best scratch margaritas of his life (Compliments to the bartender!) We passed on dessert as we were stuffed but they brought us a small piece of cake that said "Happy Anniversary" which was a very nice touch! All in all a very nice dinner! Beautiful location and charming ambience. Service was slow on most recent occasion. Food overall was good however would not recommend the tenderloin burger as it had little flavor. 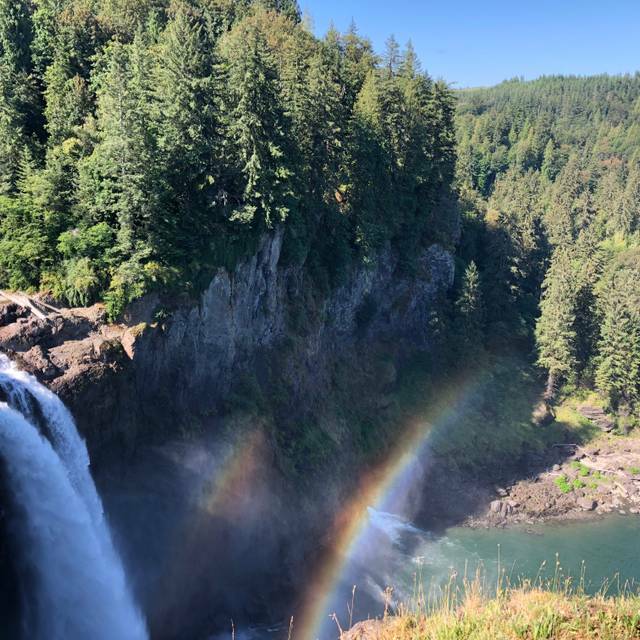 Hard to beat this location on a beautiful day as you are overlooking Snoqualmie Falls! Excellent food, outstanding service. We had a fantastic time! Very nice meal. 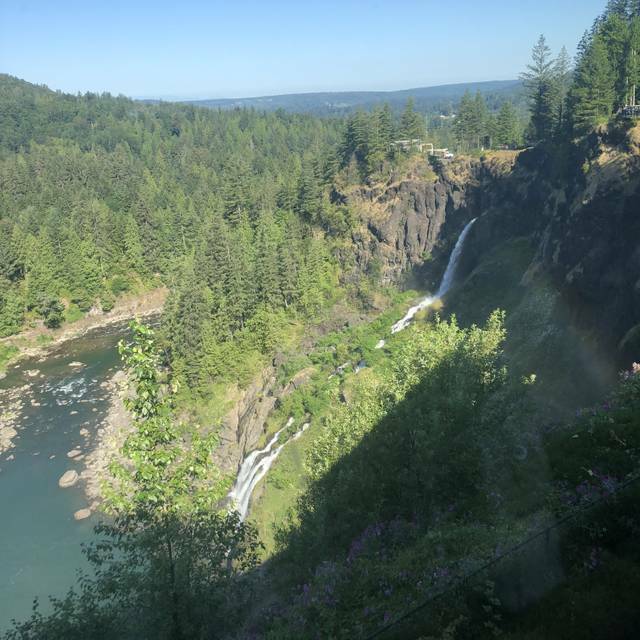 Sat by the window and had a view of the falls. Everyone that worked there was friendly and helpful, even if they were not serving our table.